The process of conditioning a few ounces of clay by hand, or even a pasta machine, is VERY laborious and time-consuming. 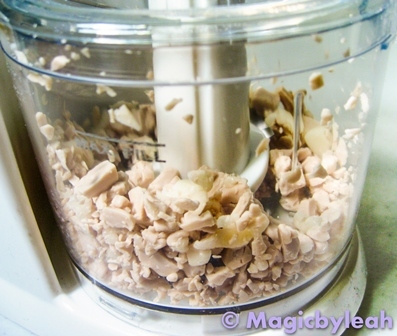 While a pasta machine is faster than mixing by hand, it gets really messy and sticky if you try to soften the clay with a liquid sculpey or other softener. Since the old process is still useful, let me give you a quick comparison to help you appreciate my new discovery. I chose random clay colors for the purpose of this demo. 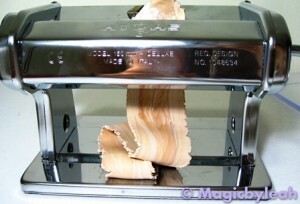 Slightly condition each individual color and cut/shape into flat sheets to fit the pasta machine. Condition the individual colors by running through the pasta machine again and again till you get a smooth and minimally cracked sheet. If doing this by hand, simply substitute ‘mix by hand’ for the pasta machine. I also recommend rolling into snakes and twisting the colors rather than working simply with ‘sheets’. I’ve heard a number of sculptors mention using a food processor for mixing clay and finally decided to treat myself. 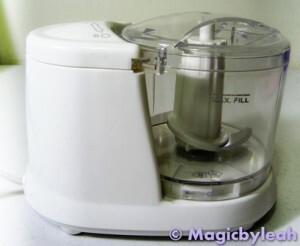 I purchased the Proctor Silex 1-1/2-Cup Food Chopper on Amazon (affiliate link) for under $20. 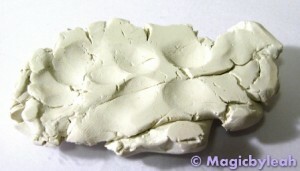 While the capacity is just 1 – 1.5 cups, it’s enough for the volume of clay required for my ‘large’ sculptures. My magical creatures are usually just a few inches tall in total. 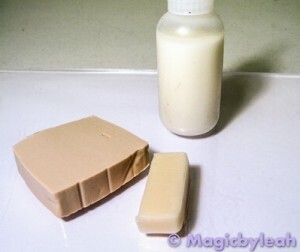 Since I’m planning to sculpt a July Fairy Baby I chose a mix of Sculpey Living Doll, Premo Translucent, and some TLS (traslucent liquid sculpey) for a super-soft mix. 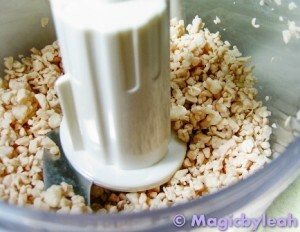 I broke the clay into medium size pieces and dropped them into the food processor. Let’s just say that my mind is 100% blown. 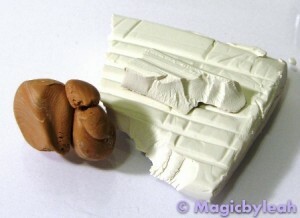 I’m watching these chunks of clay get smaller and smaller, and so well mixed. While the clay isn’t fully conditioned or blended together, having tiny chunks of distributed color will be so much easier to condition bit by bit as the sculpture comes along. I added a few drops of TLS and mixed some more. 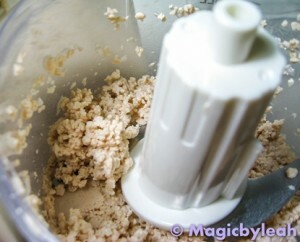 I’m glad I added this at the end because the resulting mixture looks really sticky. I suspect the clay would not have broken down as easily if I added the TLS at first. Now in case you’re wondering ‘but the clay isn’t conditioned, it’s only mixed’ that’s fine. Even when I prepare a large batch of mixed clay for a sculpture, I still condition every bit by hand right when I’m about to use it. 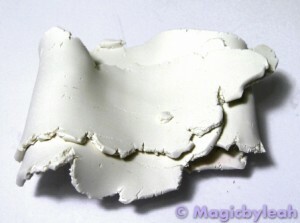 However, conditioning a piece of clay the size of a small bug is pretty simple compared to clay the size of a small bird. So instead of cutting small chunks off a large mixed block, I plan to simply scoop up a small handful of mini-chunks, squeeze between my fingers for a few seconds, and go! The most important and obvious benefit to this method is TIME. This saves me AT LEAST an hour in the sculpture preparation process. Reduction in time also reduces the amount of dust, dirt, lint, fibers… that will get embedded in the clay. A personal plus is the reduction of pain. The food processor takes the strain off my hand which allows me to sculpt for a longer period of time without aggravating my injury. 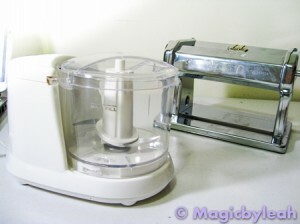 At first I considered also storing the clay in the processor since it comes with a lid. 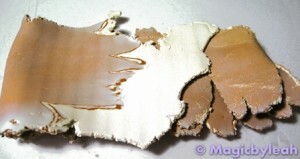 However, in reply to a helpful blog comment I now realize that the clay will corrode the processor. And so I quickly transfer the clay from processor to dedicated Pyrex container and clean up with baby wipes. I suspect the plastic will discolor easily, and so, while I am in love with my new toy, I am dedicating the processor to mixing only light/flesh color clay. I use strong colored clay like reds (most staining) in smaller quantities and will stick to the pasta machine for mixing those. Who knows, maybe I’ll splurge on a second one and dedicate to colors. Do you have any other fun tricks to help reduce time/pain in the sculpting process? If so I’d love to read about it in the comments below. What a great idea! And I bet if you needed another one for darker colors you could just buy the plastic bowl part and use the same engine. Most companies have replacement parts for broken parts so no need to buy a whole other machine. I actually just ordered one because I already see how the hard clay + old hands are going to be a problem! Thanks for the idea and test results! That’s a great idea Rhonda, hadn’t thought to get a second for darker colors. The entire machine is small and cost under $20 so I don’t think it would be too much hassle to purchase and store a second one. I am delighted with this information. 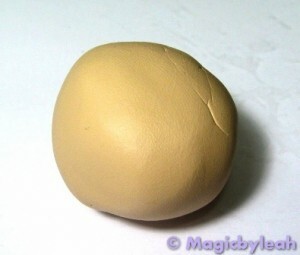 I am new to polymer clay. I suffer from M.E. So pains and aches in muscles in hands and arms is par for the course. 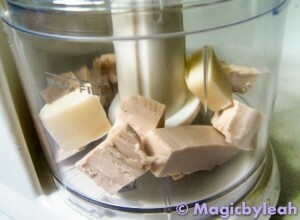 I have a food processor in the kitchen in a press doing nothing. So now you have inspired me to use it in a very useful way saving me time and pain. Thanks for the tip. Also I find your videos very inspiring..so thanks again. I tried this just to mix colors with fresh clay, and it was way too sticky and soft for my food processor, I had to add a lot of cornstarch for it work, and then after to remove the cornstarch I had to wash it with cold water, which basically ruins it if its translucent (more plaquing), and adds moisture pockets. 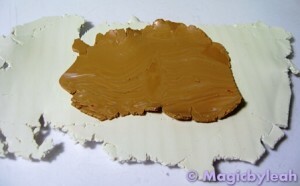 I wouldn’t try this unless you have very very old dry hard crumbly clay which is opaque!